The Amerock BP55276G10 Blackrock 3-3/4in(96mm) CTC Pull is finished in Satin Nickel. The BlackRock collection offers sleek simplicity with a contemporary indulgence. This eclectic line boasts bold shapes and sizes. The classic Satin Nickel finish provides a sleek, lightly brushed, warm grey metallic look. The Amerock BP29355AS Candler 3-3/4in(96mm) CTC Pull is finished in Antique Silver. The Candler collection is distinctively elegant, with strong lines and soft curves that blend a touch of femininity with enduring class and timeless character. Antique Silver is a sleek and lush finish with deep, rich colors designed to complement traditional, transitional and eclectic styled homes. The Amerock BP36621BBZ Sea Grass 3-3/4in(96mm) CTC Pull is finished in Golden Champagne. Sophisticated finishes meet organic inspiration in the Sea Grass Collection. Slender rays mimic the setting sun or delicate fronds, connecting your senses to textures found in nature. Golden Champagne: raise a toast to this rich metallic finish. Warm and inviting without being brassy, this attractive hue elevates designs with enviable versatility. The 3-3/4inch Artesia Cabinet Pull by Liberty conveys a sense of stylish comfort and refinement. 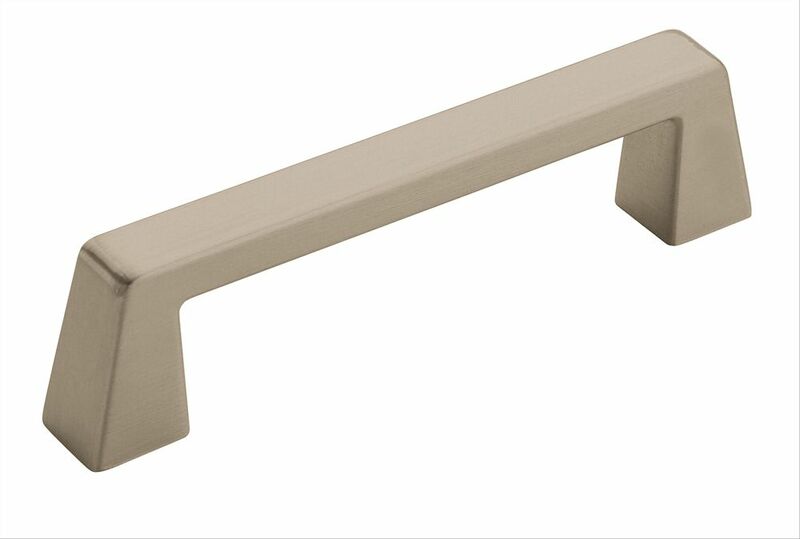 With the silky satin nickel finish, this beautiful cabinet pull adds a touch of elegance to your décor. Simply install this cabinet pull in your kitchen and bath and watch your cabinetry quickly transform from ordinary to extraordinary. Blackrock 3-3/4 Inch (96mm) CTC Pull - Satin Nickel The Amerock BP55276G10 Blackrock 3-3/4in(96mm) CTC Pull is finished in Satin Nickel. The BlackRock collection offers sleek simplicity with a contemporary indulgence. This eclectic line boasts bold shapes and sizes. The classic Satin Nickel finish provides a sleek, lightly brushed, warm grey metallic look.